Android-Like JellyLock App Launcher Now Available for iOS 7! JellyLock is one of the popular tweaks inspired by Android’s lock screen; the tweak, thankfully, has just been updated for iOS 7. Interesting read: Snoop in to See What Jailbreak Tweaks Saurik is Using on his iPhone! 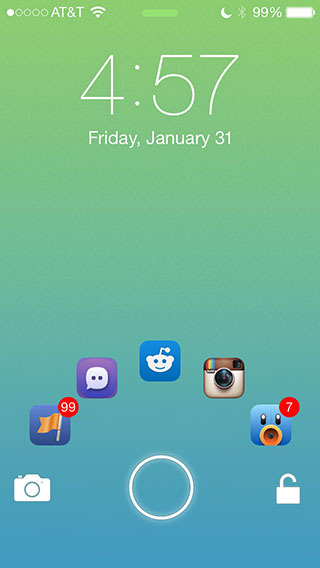 JellyLock7 iOS 7 jailbreak tweak is an awesome lock screen launcher inspired by Android. JellyLock iOS 7 lock screen tweak gives you quick access to as many as 6 apps. This Android inspired, iOS 7 launcher replaces the Slide to Unlock text on the lock screen with a circular unlock icon. This icon also acts as an app launcher for the quick access apps. You an customize this tweak from Settings app. 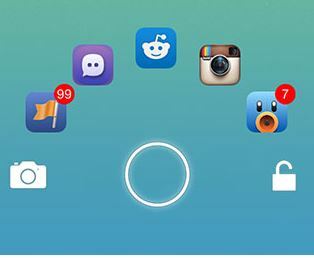 Color changes to the opacity of the circular app launching icon can be customized. Go to Settings > JellyLock7 > Appearance to change the settings. You can also select to hide the badges. 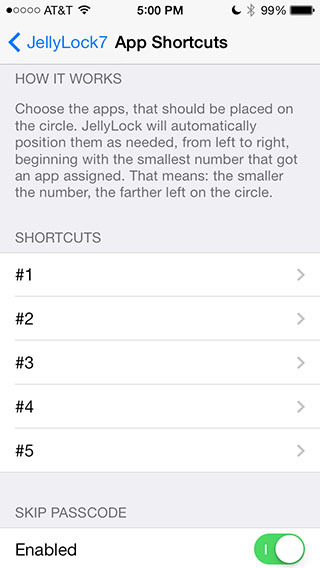 For assigning apps to the icon shortcuts, go to Settings > JellyLock7 > App Shortcuts. As said before, as many as six apps can be added to access quickly. From the settings, you can also enable the toggle and skip the passcode when launching an app from JellyLock iOS 7 lock screen tweak. After installing and customizing the tweak, you just need to drag the app shortcut to unlock icon in order to launch that app. Some users are reporting an issue with setting the native Mail app as one of the shortcuts. Let’s hope dev fixes this bug at soonest. Read: See ‘iOS in the Car’ in Action Running on an iOS 7 Simulator! Available for free on Cydia, JellyLock7 iOS 7 lock screen tweak is developed by Max Katzmann.